This past year, I decided I wanted to be a little more self-sufficient at Peace House. I wanted to be able to do some renovations on my own and not feel like I needed a contractor for every little thing. I debated taking a working vacation where you take classes and build a log cabin with a small group of people. In the end, I decided to take some woodworking classes at Makeville Studios in Brooklyn. It went really well! I loved it! Our first project was to build a small table. I decided to build something for the Geeks OUT fundraiser: McKellen Me Softly. 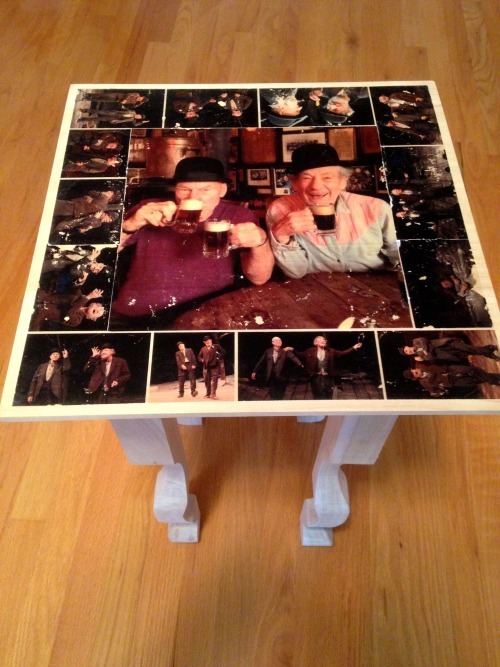 I decorated the top with photos from Ian McKellen and Patrick Stewart in their production of Waiting for Godot. Once I had that first project under my belt, I wanted more. I was in West Elm looking at their desks. 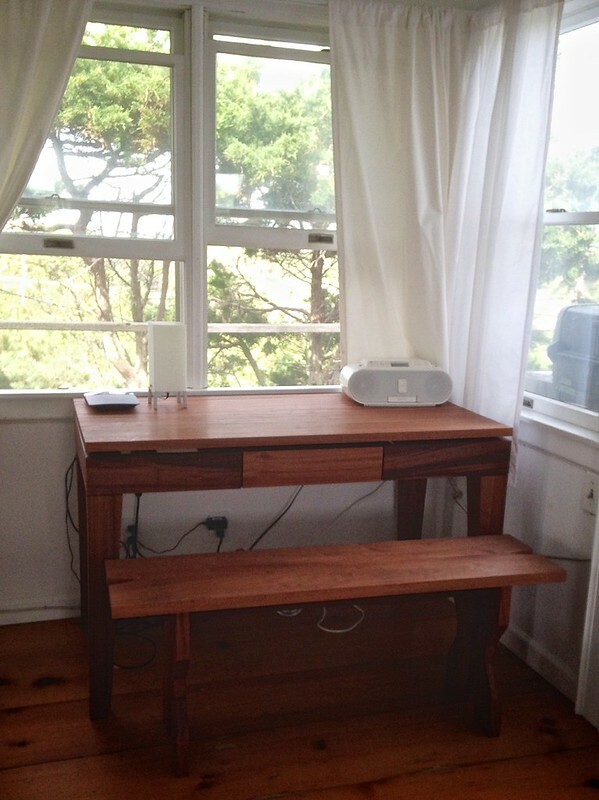 The previous owners of Peace House had taken their desk with them and I needed to replace it. 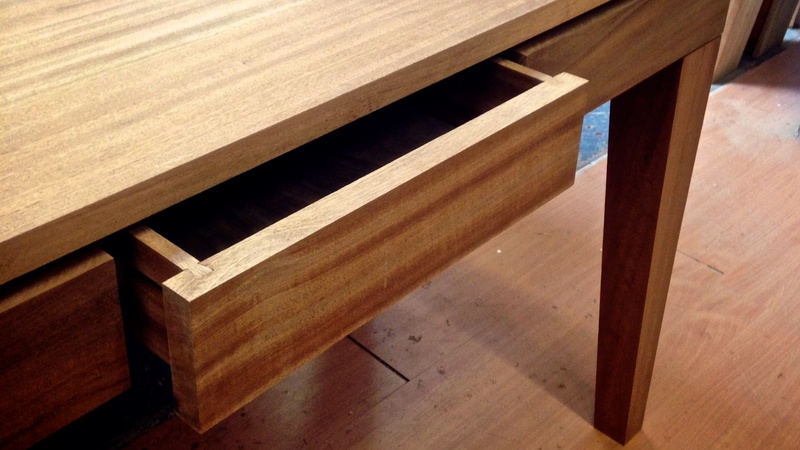 As I opened the drawers to see how it was built, I became convinced that I could do it myself. 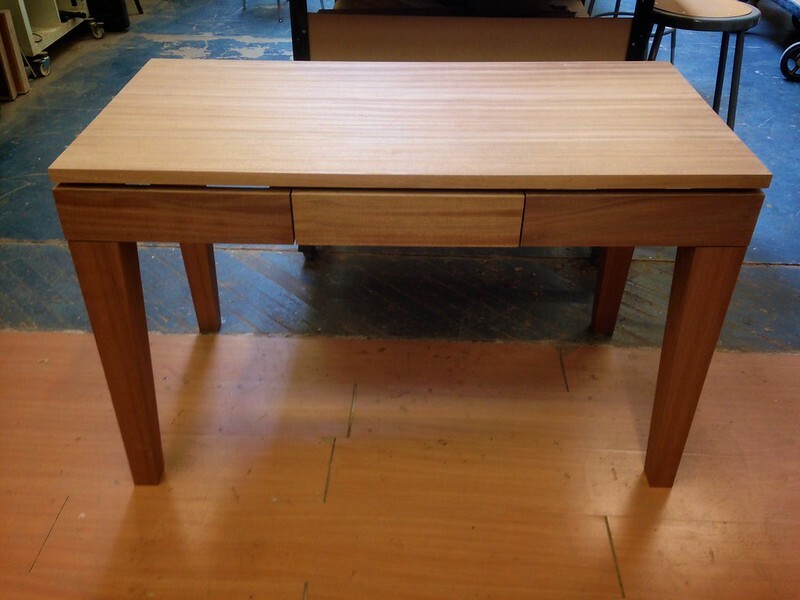 So I talked to my teacher from the woodworking class about the possibility of building a desk. He was optimistic. We talked about design. One of the things I liked about the West Elm desk is that the apron seemed to visually float above the legs and the desktop floated a bit above the apron. My teacher helped me pronounce that even more by making the desktop literally float above the apron. It is actually resting on four ribs within the apron. It makes the piece feel significantly lighter. Before starting on the woodworking, I built a model in SketchUp. That process was beyond tedious, but I'm glad I did it. 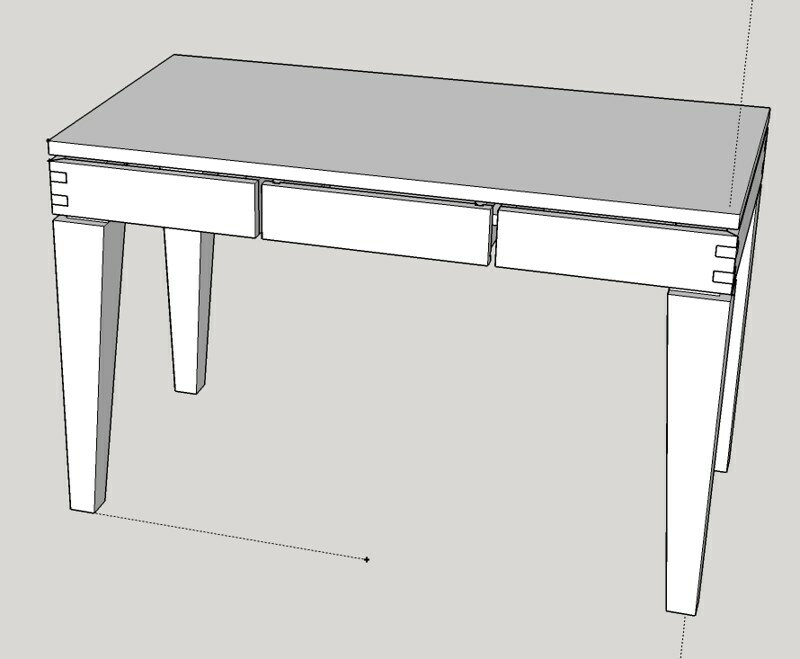 There were some things I thought were painfully obvious, but when I actually drafted it in SketchUp, I was significantly wrong in my measurements. Here's a picture of the model. The hardest part for me is understanding how thick the wood needs to be. I was constantly concerned that things were going to be weak from being too thin. It's hard to find information that tells you, for instance, how thick a desk apron should be. I thought it would be one of those things you could sort of eyeball, but that's not the case. In hindsight, everything is a little too thick. That desk is immovable. It's a little too sturdy. 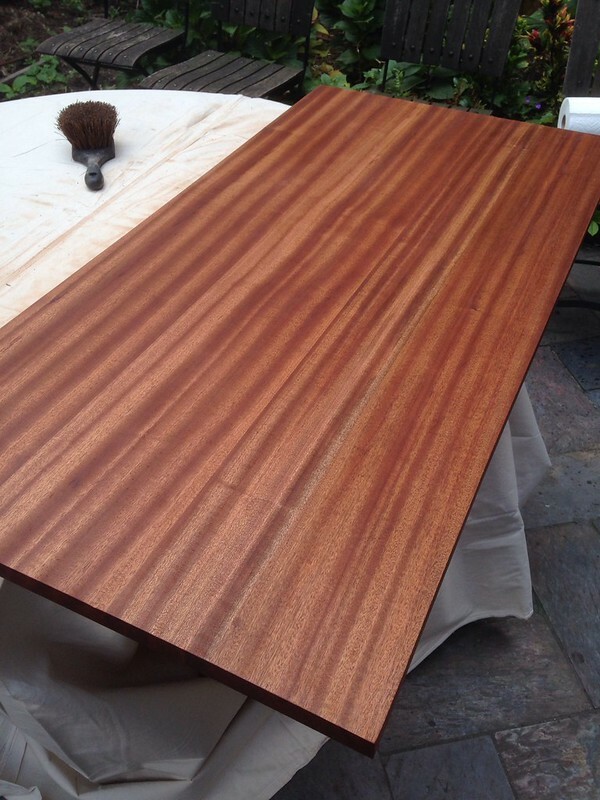 The wood that I used is very strong and in no danger of cracking or breaking. In the future, I'll be aiming to make furniture that is a little lighter on it's feet. The only major disappointment is that I had picked a piece especially for the front. It was a piece of wood with a lot of knots that made a beautiful swirling pattern. Unfortunately, knots make for wood disasters (at least for beginners). I had endless problems with that piece of wood and it eventually died on the router table. So I had to use another piece of wood for the drawer front. 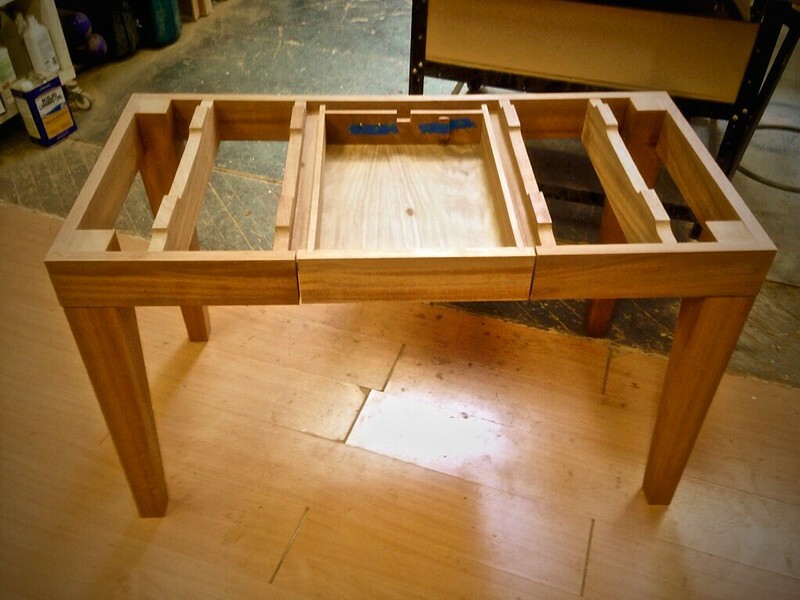 The corners were mitered joints with splines to hold them in place. They turned out beautifully. 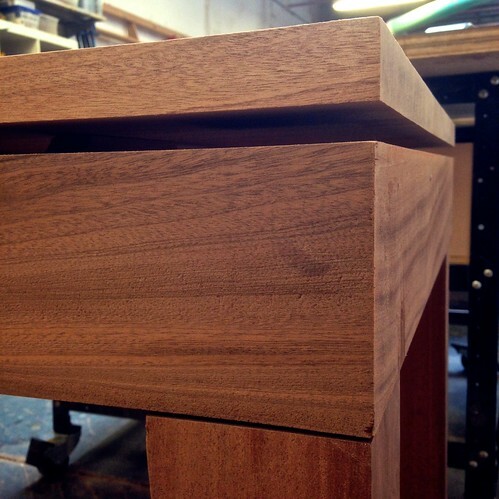 I was most intimidated by the drawers because it called for some dovetail joints. It turns out this was my favorite part of construction. 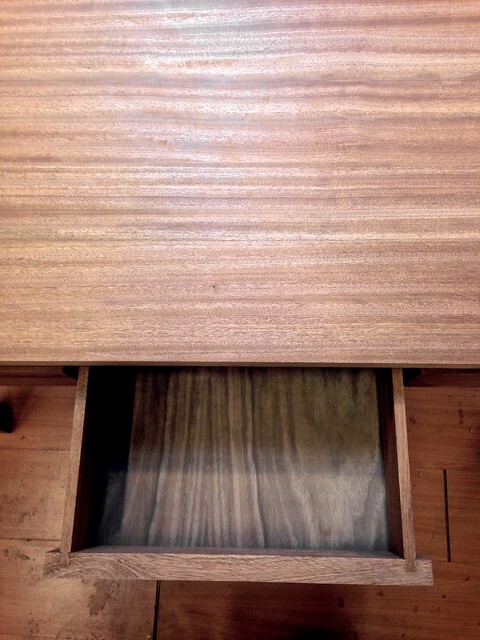 I love the puzzle-like aspect of woodworking. I stained it in the backyard of 218 W 15th St. I used a simple Danish Oil. 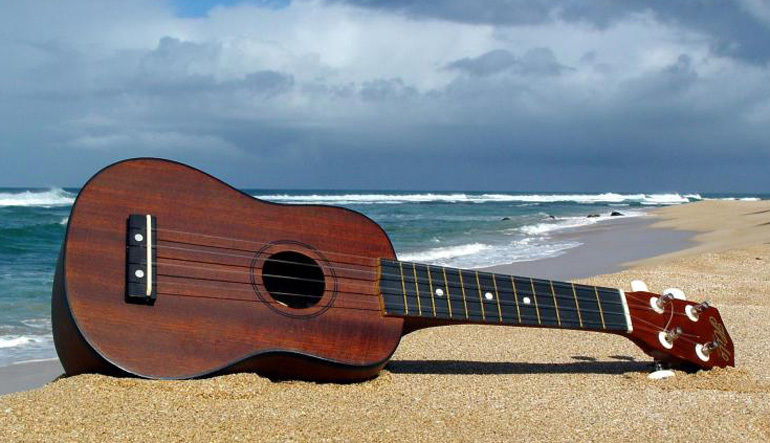 It really brought out the grain of the wood. I must say, it looks really sumptuous in person. After the desk was out on the island for a month, the wood swelled and the drawer got stuck. I have to significantly sand down the rails so that the drawer is functional again. Once that happens, I'll be ecstatic with it. It's really a nice place to sit in the corner and get work done, though I find myself constantly feeling the wood instead of paying attention to work. I had made a small bench out of the same wood to go with the desk. Once I spent some time on the bench, I wondered why more people don't use simple benches at a desk. Next on the list: I'll be using the same type of wood to make a matching bed and nightstands. If you live in NYC, you should go see Wig Out! at The Vineyard Theater.